I'm a bit rusty. I know that sounds odd, but I'm rusty at making muffins. I used to be able to have apple-oat muffins down and be in-and-out with the dishes clean in under an hour. Today it took almost an hour just to get the muffins into the oven. Well, I was also taking pictures (though just quick snips) and being careful with my measurements (metric weights, here I come!) to save time in the future, and I was remembering. I remembered why I love muffins. There's something friendly and forgiving about muffins. They're supposed to be lumpy and bumpy, and a little mistake is easy to cover. If they rise funny, well, its a muffin. I guess it isn't like a cupcake where a mistake can be covered in frosting, but if you bite into a cupcake and it isn't fluffy and uniform, things are a bit wacky. I'm very much pro-muffin and hesitant towards cupcakes, but I guess it is because we do call them muffin pans. And they make a much more satisfying breakfast. My favorite muffins are apple-oat muffins, and at the farmer's market on Saturday (I thought I had ended, I was so thrilled when I saw an ad on public access!) and saw bins of gorgeous apples, I knew I just had to make some. Most people are dreaming of apple pie right now, but I dream of muffins. Okay, and I'm scared of pie crust. I like mixing things and being done- no rolling pins required. I asked the guy-who-knows-all which apples I should try, and picked up a few. I don't remember their names. I only ended up using one and a half of the apples, the first one was so large, but it was deliciously sweet and crisp. The second one was green and had a familiar, but somewhat deterring, flavor that I couldn't quite put my finger on. I finally recognized it. It tasted kind of like the artificial green apple flavor candies are flavored with. But the apples mixed together and in the muffin made for a tasty muffin. I'm not sure if it was the extra care put into these, the fresh local apples. or the fact that I bit into one right out of the oven, or the months without then; they seemed yummier, and a bit sweeter, than ever today. As for trying them with a dab of peanut butter in the middle- I think I'll save it for being slathered on top if I fancy it at the moment. Preheat oven to 400ºF. Grease a muffin tin with cooking spray. 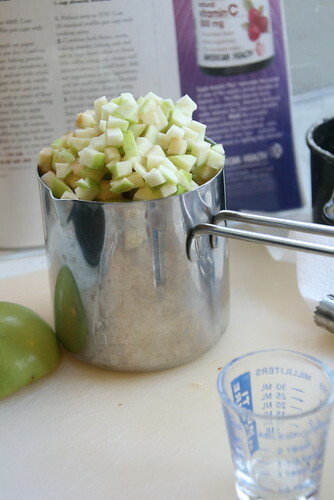 Place apples on paper towels to drain, pat dry. Combine flours, oats, sugar, baking powder, baking soda, salt, and cinnamon in medium bowl. Whisk together. If small lumps of sugar remain, that's fine. It makes it even better. In a small bowl, whisk together yogurt, milk, oil, vanilla extract, and egg until smooth. Make a well in center of flour mixture, stir in milk mixture just until moist. Mix in apple. Using a #12 scoop, scoop mixture into prepared muffin cups. Bake 15-20 minutes or until muffins spring back lightly when touched. Remove from pan to cool.